Shot this one for work. I wait for the train home at L.A. Union Station in the same spot each day, so this scene is familiar. 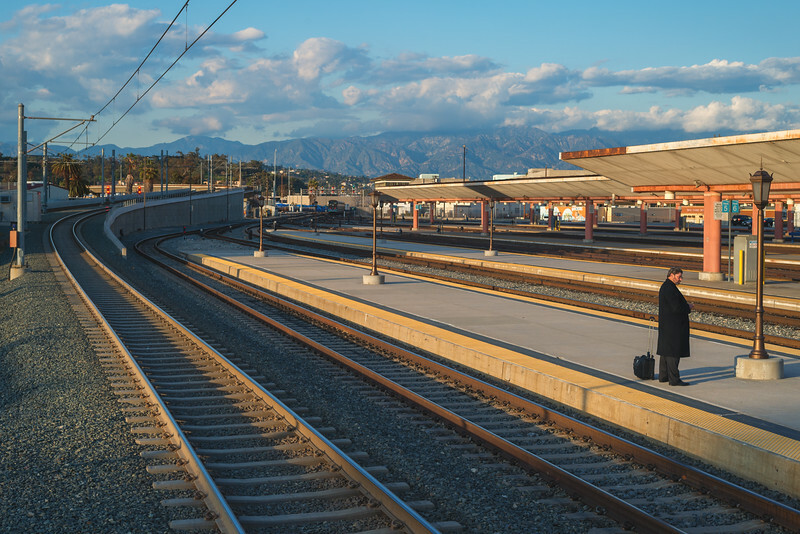 But yesterday was a little different -- a lone man waiting near the end of the adjacent platform and some really nice light about an hour before sunset. With my train approaching, I managed to grab the Nikon out of my shoulder sling and quickly compose a shot and fire off a few frames. The result: a pretty good photo with some nice lines courtesy of the train tracks, platforms and overhead catenary wire. The sunset turned out to be pretty colorful an hour later -- then again, the scene may not have been as good without the man-in-black standing there. Camera and lens: Nikon Df + 50mm 1.8 lens. Shot in RAW and processed in Lightroom and Google Nik Collection's Color Efex Pro. All my galleries are here. Click on photo above and then right click for a free download of the pic if interested.